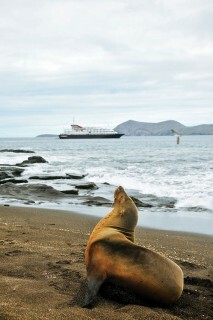 Pikaia Lodge is perched 450 meters above sea level amid the volcanic highlands of Santa Cruz Island. 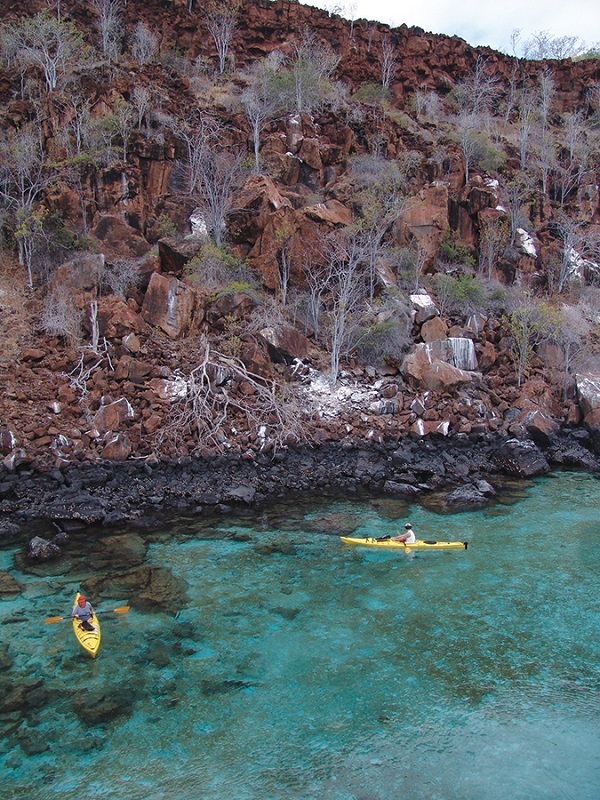 Guests on a kayaking excursion. 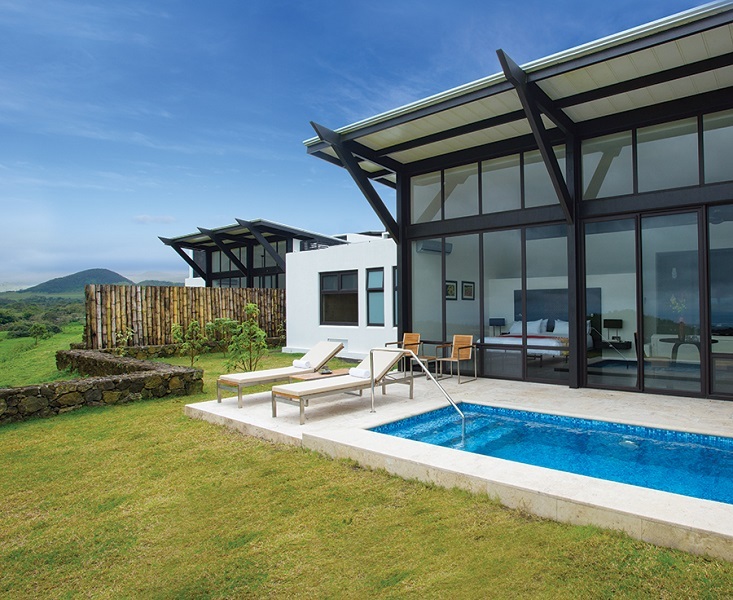 Situated in the highlands of Santa Cruz Island, the newly opened Pikaia Lodge began with founder Herbert Frei’s desire to build a luxury retreat that was sustainable, not only out of respect for the pristine surrounds, but also because of its off-the-grid location on the crater of an extinct volcano. 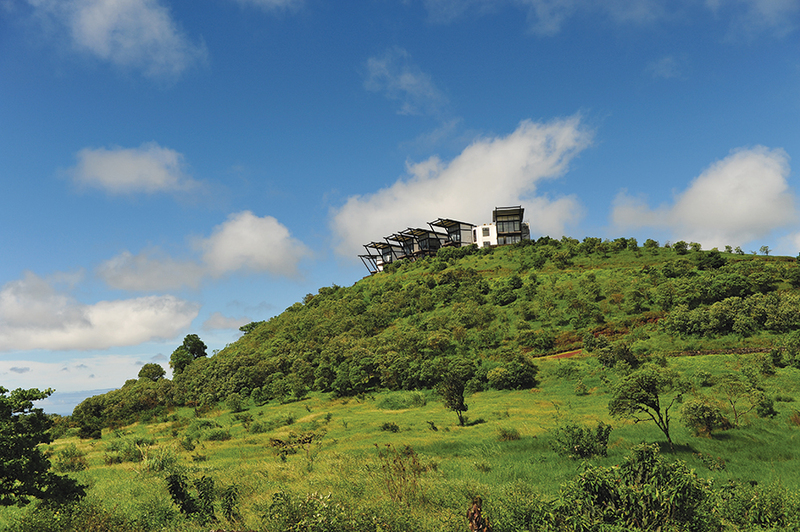 Completely carbon neutral, the lodge generates nearly all of its electricity through solar and wind energy, while rainwater is collected in a rooftop reservoir system and treated on site for use by the lodge. The 31-hectare property even includes a private reserve for giant tortoises. Green credentials aside, what makes Pikaia Lodge unique in the Galápagos is the extent of its luxury—a far cry from the ubiquitous backpacker digs in Puerto Ayora, the island capital. There are only 14 rooms, all of which feature terraces (the largest suite has a pool) and floors of bamboo and Peruvian marble, enormous bathrooms, and floor-to-ceiling windows looking out over even bigger vistas, stretching uninterrupted to the Pacific Ocean and sister islands of the archipelago beyond. The same views envelop Pikaia’s Sumaq Spa, which, though small, fits in a state-of-the-art infrared sauna and bubbling whirlpool. And then, of course, there’s the most important element to Pikaia’s winning formula: its location in the center of the Galápagos Islands. 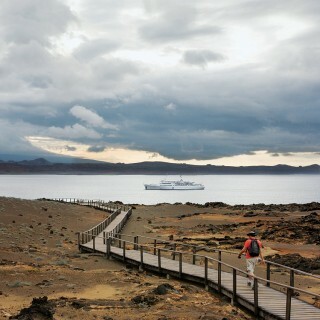 Four- to ten-day Exploration Packages guide guests by land and by sea (the resort has its own 30-meter luxury diving yacht, the only one of its kind in the islands) to promontories that rise high above the ocean and sandy beaches unmarked by footsteps. Early mornings start with traditional Ecuadorean breakfasts of plantain empanadas and yucca bread, surprisingly delicious fuel for days spent seafaring, hiking, kayaking, and snorkeling off islands teeming with turtles, birds, and iguanas. Evenings at Pikaia are spent marveling at the sunset with cocktails in-hand followed by gourmet dinners at the Evolution restaurant, where young Ecuadorian chef Norman Brandt puts the emphasis on local produce. And on clear nights, guests can arrange a guided star- gazing session as a prelude to their slumbers.